Sony has told TechRadar that smartphones are critical to its success and is a key way of driving consumers to its other products. 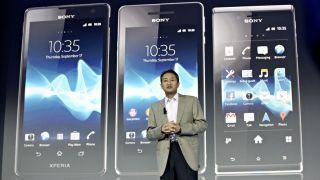 During Sony's IFA 2012 press conference in Berlin, company president Kazuo Hirai revealed the company was focussing on three main divisions; gaming, mobile phones and digital imaging. TechRadar spoke to Calum MacDougall, Head of Xperia Marketing at Sony to find out how important the mobile side of the business is to the Japanese firm. MacDougall said: "what's pretty clear is mobile is critical to the overall business. "If you want to be a successful consumer electronics company you need a successful smartphone division, not just within itself, but as an entry level and a way of driving consumers towards other new, connected products." "The smartphone is the most frequently changed device, you'll buy a new phone more often then you buy a new tablet, PC or TV, so if we get people buying Sony smartphones then it affects the overall business." The launch of the Sony Xperia T, Xperia V and Xperia J in a new range of handsets signals the firm's strong intent in the mobile market, as it looks to refresh and innovate on a regular basis, allowing it to keep up with trends and the competition.